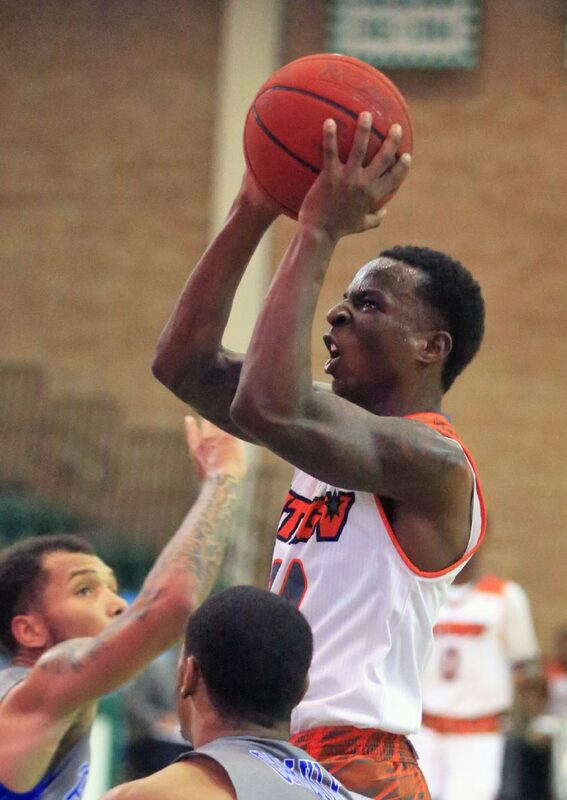 University of Texas Rio Grande Valley's Javon Levi drives to the basket against Hampton in a non conference game at UTRGV Fieldhouse Saturday, Dec 30, 2017, in Edinburg. After nearly five years of discussion regarding a possible move to Edinburg’s new Bert Ogden Arena, the UTRGV men’s basketball team is “currently scheduled” to play all of its 2018-19 home games at the UTRGV Fieldhouse, the UTRGV athletics department announced Monday. UTRGV’s season opener against Oklahoma on Nov. 9, long anticipated to open Bert Ogden Arena, is among the games now slated to be played at the UTRGV Fieldhouse. After the arena’s opening was delayed by a year, UTRGV pushed back its game against Oklahoma, instead scheduling the matchup to begin the 2018-19 season. Again, that plan was “pending a lease agreement to play at Bert Ogden Arena,” according to a UTRGV release from June 27, 2017. Marc Solis took over as the President and CEO of Facilities and Entertainment at Bert Ogden Arena earlier this year. The facility has a seating capacity of about 9,000, compared to 2,500 at the UTRGV Fieldhouse. UTRGV’s matchup against Oklahoma was originally scheduled thanks in large part to UTRGV’s connection to Sooners coach Lon Kruger. Kruger’s first head coaching job was at Pan American University from 1982-86, and he has remained a major contributor to the program in the years since. UTRGV men’s basketball coach Lew Hill was an assistant under Kruger for 12 years at UNLV (2004-11) and Oklahoma (2011-16) before accepting his position at UTRGV in 2016. The agreement to play Oklahoma was reached around the same time, and Kruger said Monday that the shift in venue will have no impact on the matchup. When construction of the new arena was announced on Nov. 1, 2013, King had already been in conversations with the Vipers and city of Edinburg about potentially using the arena for men’s basketball home games. “For our continued growth, moving the men’s games from the fieldhouse to an 8,500-seat arena is a very exciting proposition,” King said at the time.” “It helps recruiting, it helps the coaching staff and it brings a different brand. There’s nothing like playing in a state-of-the-art arena with club suites and great courtside views. We’d have the ability to maybe bring in some marquee teams, marquee tournaments. When Hill was hired as UTRGV’s men’s basketball coach in 2016, he said the new arena was part of the university’s pitch to try to make the job appealing. He said he hoped to use the arena in recruiting and to help him fulfill his ambition to play more home games against better competition.